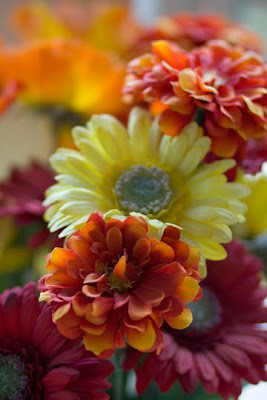 The faux flowers that brighten our home. Today someone told me I am so fake. And that we all get what we deserve and that my chi had it coming. What it had coming I don't know although I can make some assumptions as to what she was referring to. Probably Shawn's paralysis and our now 7 month long ordeal. Hmmm ... interesting. I'll admit I was a little irked by it but not upset, definitely not hurt. I mean this comment came from an alcoholic train wreck. So the source was considered. But it did get me thinking about being fake or really, not living our truth. We all walk through our days not being honest. Some of us more than others, some non-truths being more large than others. In the Yoga Sutras of Patanjali, the first limb of the 8 Limbs of Yoga is the Yamas, the restraints of our behavior we should abide by. One of those Yamas is truthfulness, Satya. We should be honest with ourselves and others in thoughts, words and actions. Before that Yama though, is Ahimsa, non-violence or loving, kindness and compassion. Ahimsa and Satya go hand in hand. What if being truthful causes you to be less than compassionate? Do you still tell that truth at the risk of hurting someone else? Some people might do that specifically to hurt another. So, if you aren't truthful are you then fake? her that I tell her this? This person most definitely would have wanted to know why after hanging out a few times that I formed this opinion. Would she have wanted to hear that aside from being a loud, obnoxious drunk, I felt that she was overcompensating with a really strong, sometimes rude personality for her total lack of self-esteem. Personally, knowing that I would only see her occasionally, I didn't feel it was worth the drama or potentially hurting someone's feelings. Even though I don't like her, I don't wish her any harm. So what it boils down to is, if you don't want me to be fake, can you handle the truth?